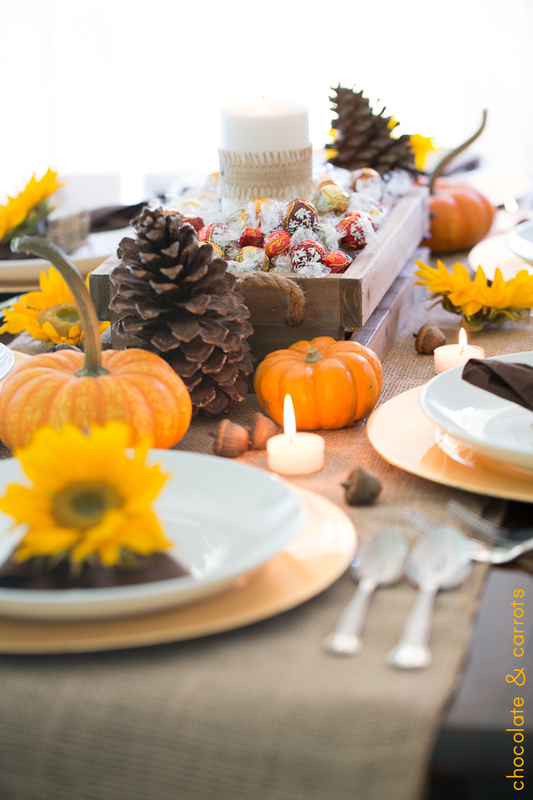 A beautiful chocolate and autumn inspired Thanksgiving tablescape and a delicious Salted Chocolate Pumpkin Cup recipe just for you! This post is sponsored by Lindt. Thanks for supporting companies I believe in and allowing me to create more unique content for you. Chocolate goes with pretty much everything, including Thanksgiving! 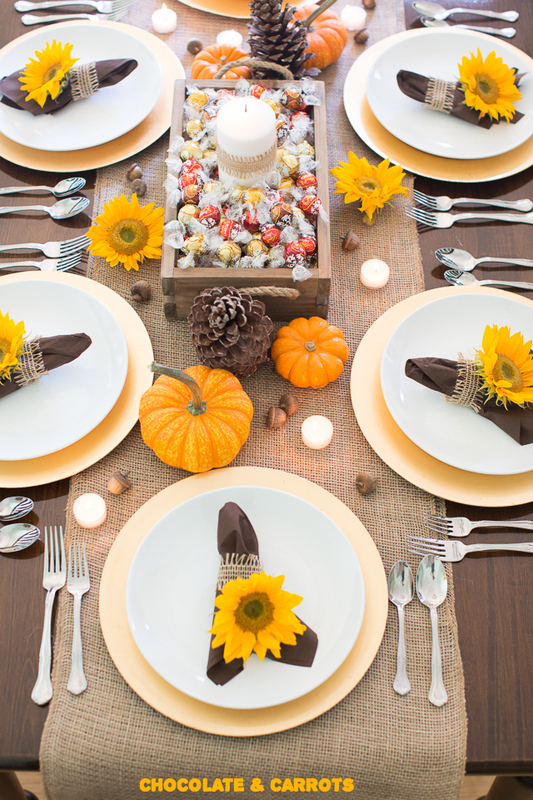 From a beautiful tablescape to a delicious spiced recipe, there are numerous ways to incorporate Lindt chocolate in your Thanksgiving Day. 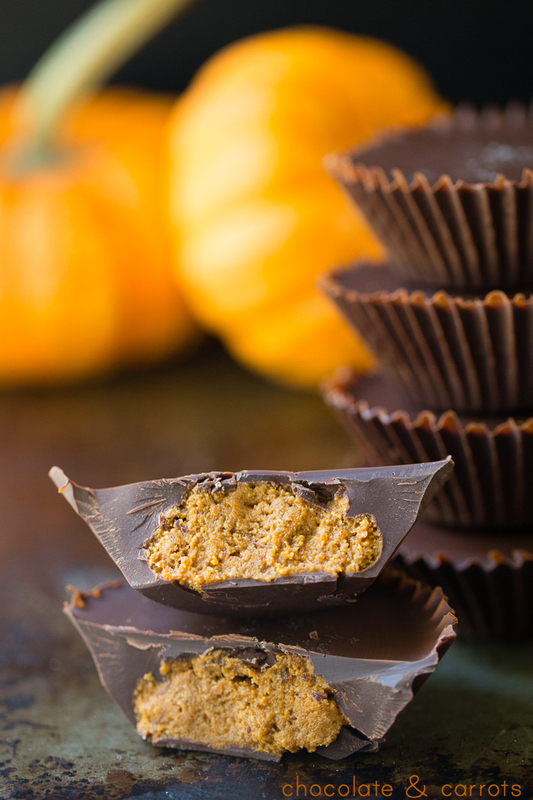 First off, I made these sweet, salty and spicy chocolate pumpkin cups that can easily be made a few days ahead of time. That way you have more time on Thanksgiving to spend with family! 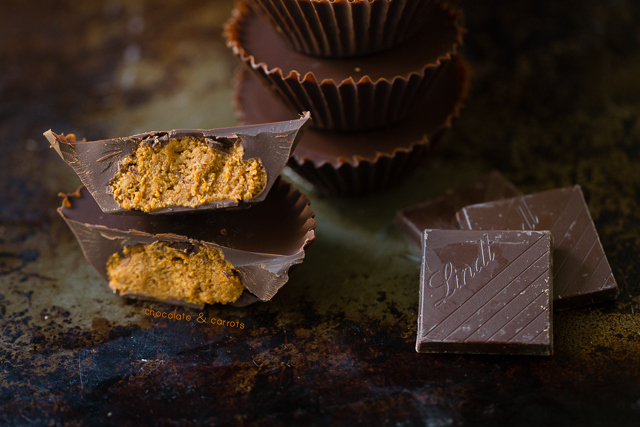 The Salted Chocolate Pumpkin Cups are smooth and creamy, thanks to the Lindt EXCELLENCE bars. The EXCELLENCE chocolate has a beautiful profile that melts evenly to reveal complex layers of flavor, engaging all of your senses. Ahh! Then, when filled with the spiced pumpkin and topped off with sea salt, you’ve got a wonderful Thanksgiving treat! 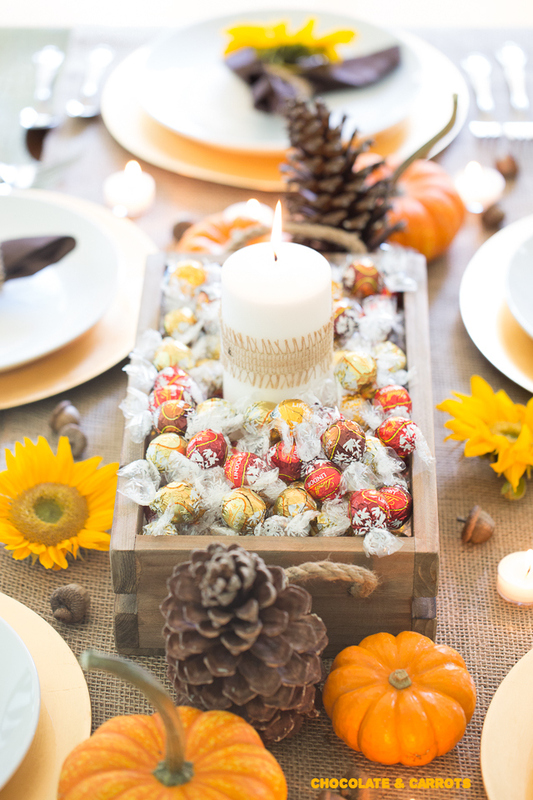 Now, let’s talk about the beauty of a simple Lindt LINDOR and autumn inspired tablescape. It came together quite quickly, especially when I took some pine cones and acorns from my backyard to fill in the spaces of the table. The table’s centerpiece is my favorite part, though. Not only are the gold, brown and red pops of color beautiful and inviting, but they’re also delicious! How could the Lindt LINDOR truffles not be?! I may or may not have sneaked a few from the basket during the photo shoot. 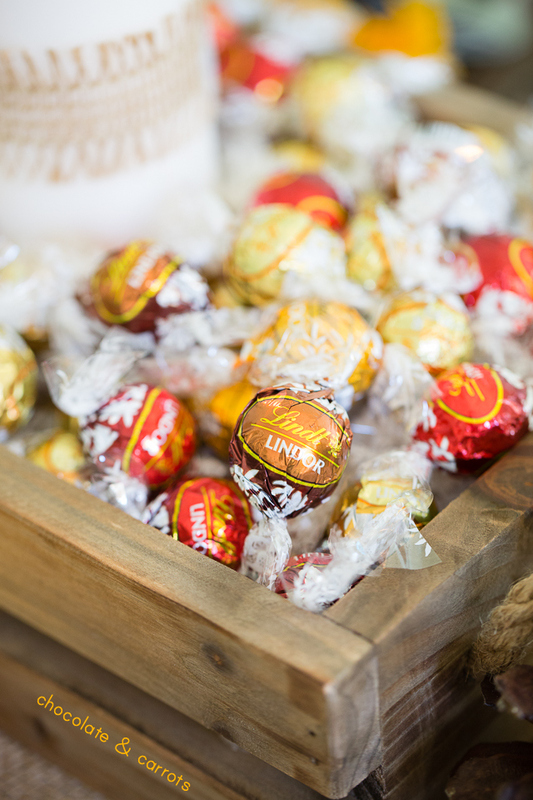 Each Lindt LINDOR is crafted with a hard chocolate shell and irresistibly smooth melting center. When the shell breaks and melts in your mouth, you melt away in the moment. And when you emerge on the other side, everything is a little bit better. That’s the #LINDORmelt. Sign me up! And that, my friends, we should all be thankful for this Thanksgiving. Setting a Thankgiving table with LINDOR as the centerpiece shows your guests how much you care…both for their sanity and flavor experience. 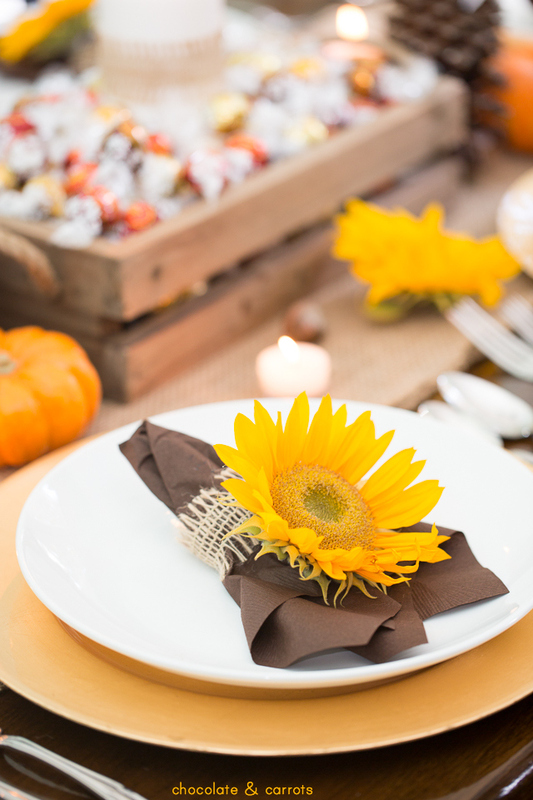 What’s better than a tablescape that can be eaten from throughout the holiday? 1/4 cup white whole wheat flour – graham cracker crumbs? Temper your chocolate (detailed instructions here). Using the back of a spoon, paint muffin liners up the sides and on the bottom. These will harden in just a few minutes. Stir the pumpkin purée, honey, pumpkin pie spice and flour together until combined. 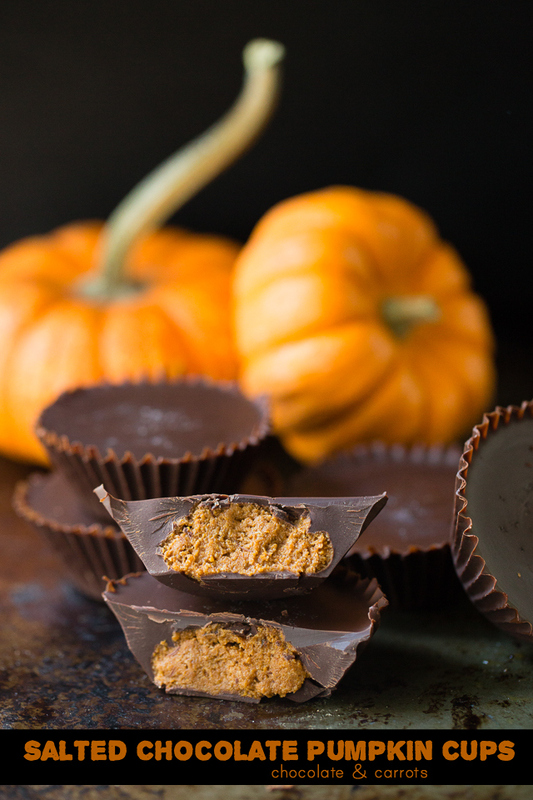 Place a 1-2 tablespoon of pumpkin mixture in the bottoms of each chocolate coated cup. Pour tempered chocolate over the pumpkin until it reaches the top of your cups. While the chocolate is still melted, sprinkle a pinch of salt on top. Allow them to harden at room temperature and store in an airtight container. Note: If you prefer not to temper the chocolate, you can simply melt it and keep the cups in an airtight container in the fridge. This post was sponsored by Lindt. I received samples and compensation for this post. All opinions are my own. Please read my disclosure policy for further information. I love this idea! Of course pumpkin filling would be wonderful enclosed in a chocolate candy… 🙂 and salt helps! Oh man, no where to but these? They look so good. I love Lindt’s. My sister is in a nursing home and all she wants us to bring here are Lindt’s truffles. When we go for lunch, she wants them before anything else. Will have to get her a bunch for Christmas. The best chocolate in the world. Just melts in your mouth. I’m thankful for my husband’s parents for raising such a loving, caring, respectful person. The centerpiece would be a hit with kids! This is lovely!